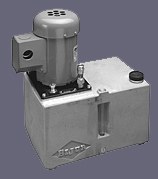 Lube pump V5W is a motor driven gear pump. The unit is pre-set to discharge 125 (cc/min) . A 125 micron suction filter part number S181 should be replaced when needed. ©2054 Devco Corporation. All rights reserved. Devco is a registered trademark of Devco Corporation. All other brands or products names, marks and logos are trademarks or registered trademarks of their respective companies.